When did you meet Tary? … but you are married now for a long time, you got three kids, two daughters and one boy. So did you open a school then or when was that? About 96 we decided to start a school. We have been teaching classes without a school, just been teaching for gyms, for various different people and we thought: “Why not? It is about time”. So we started our own school and tried to have a regular place where we hold our classes rather than traveling out too much. So it gradually, little bit by little bit, grows. Now, we have our own school, we have our own permanent school. Now we have our own centre, training centre which is great. It is like a home – with space, with potentials. 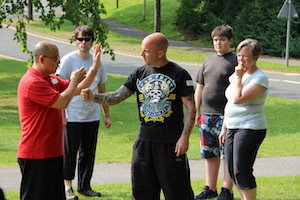 All my seminars, workshops, educational courses, grading assessments – all in my own centre, which is a wonderful feeling. It is like the traveller finally got a space… So we are really happy about that. What do you teach in your school? Yes, yes, you also, yes… Cheng Man Ching is another disciple of Yang family, so actually we are not far off in Yang style, although some details will be different. 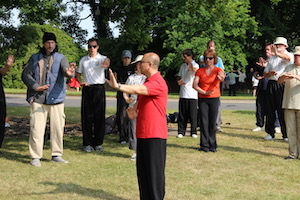 – We promote all of that as well as Qigong.